Scrat's epic pursuit of the elusive acorn catapults him into the universe where he accidentally sets off a series of cosmic events that transform and threaten the Ice Age World. To save themselves, Sid, Manny, Diego, and the rest of the herd must leave their home and embark on a quest full of comedy and adventure, traveling to exotic new lands and encountering a host of colorful new characters. Now its first teaser trailer is released. Are we quivering with anticipation? After last month’s setback wherein I failed to predict the Academy would prefer a not very good movie over a movie that Skrillex contributed to the soundtrack (obvious in hindsight), I feel a little better this month when the Ursa Major nominees matched my predicted list perfectly for the second year in a row. A little better, because, seriously, what else were we going to nominate? Hey look — we’re back to Free Comic Book Day stuff! First off, did you know that Ice Age: Continental Drift had the highest world-wide box office take of any animated film in 2012? Well it did, by a comfortable margin of millions. Now Boom! Studios’ Kaboom! imprint is carrying on the story and the world-famous characters with their offering for Free Comic Book Day, Ice Age: The Hidden Treasure. “When Crash and Eddie hear about a haunted treasure in a place called Bone Valley, they can’t get the idea out of their heads! After convincing Peaches and Sid to join them on their journey, they set off to become treasure hunters…but what surprise awaits them where X marks the spot?” Crash and Eddie are two rather manic opossums, Sid the sloth is their friend, and Peaches the mammoth is their niece. Yes, it somehow all makes sense! 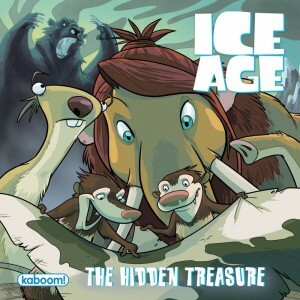 Hidden Treasure was written by Caleb Monroe and illustrated in full color by Shelli Paroline and Braden Lamb. Remember, Free Comic Book Day is May 4th. Note: I have been asked by crossaffliction to review this movie, as he is "on vacation". I understand I have big shoes to fill, so please, save the tomatoes until the end. First off, I should probably explain the title of this review. It has to do with what a pain it was to go see this movie. My car is broken, and it is literally a hundred degrees outside. No biggie, go through Main Street and it isn't far from my house, walking won't be too hard, right? Unfortunately, Chanute won some Google-partnership thing. I'm not exactly sure why that means they have to tear up half of Main Street and temporarily close many small businesses there, but by God that's what they did. What this meant for me was that I now had to walk much farther to circumvent the construction. Perhaps not much further, but I'm a hundred-something-pound weakling. I would have shaken my fists in anger to the heavens, but it was simply much too hot for such activity. So, by the time I reached the theater, I was sweating like a whipped bantha. Anyway, on to the actual review. The Annies are done and the Oscars were last Sunday. Rango inevitably won Best Animated Feature, so there is really not much reason to go on about it. Meanwhile, the Ursa Major nominees will be announced next month, so guess what next month’s column will be about. For now, however, we might as well begin the process all over again; that’s right, I’m going to call next year’s Oscars and Annies right now! I mean, everyone knows it’s going to be Brave, anyway. Sure, Ice Age is just a silly, furry, animated flick full of jokes, but some scientists feel the need to tell you the real thing wasn't all tae kwon dodos and sabretoothed squirrels.